We were approached by Tim Pullen, Chief Executive Officer of Cloudtech, a leading researcher and developer of custom Cloud-based applications for business use. Based in Dundrum in Dublin, Cloudtech had already been trading for some time, and had reached the point of major expansion. Realising the importance of having a dynamic and effective website design to showcase all company services, and being impressed with other sites in our portfolio and our knowledge of the sector, Tim engaged us to build the new website for Cloudtech. 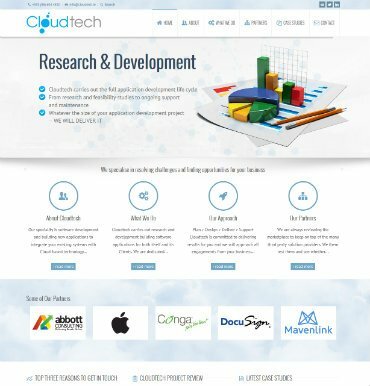 Extensive consultation was conducted with the managing partners of Cloudtech in order to best determine how to portray on the new website their extensive expertise in such a specialist and technical field. We knew that as each prospective Cloudtech client would have highly specific needs, terminology used would have to be correct and precise at all points. This placed content writing at the core of the process, with a need to balance descriptions of Cloudtech services against the most common keywords used by those seeking to avail of them. A multi-layered review of all content took place, with input from all stakeholders, until all were satisfied that the finished content accurately and optimally captured the essence of Cloudtech. An attractive theme was selected to best suit the agreed-upon menu structure of the new site, and an elegant colour scheme of light blues and a cloud motif was chosen to subtly enhance the ‘Cloud’ element of Cloudtech operations. Logos and credentials of key business partners including Apple and Salesforce were prominently displayed to highlight Cloudtech’s standing and expertise in their field, and elegant graphics and imagery to illustrate the site were both sourced and designed. Prior to going ‘live’, the new site also benefited from back-end SEO processes, as standard on each of our website designs. We liaised closely with Tim and partners at each step of the way to ensure they were satisfied with progress, and in the end, we delivered them a website that met and even exceeded their expectations. Kick-start your transition into the Cloud today, visit www.cloudtech.ie today!